Sanctions can also be imposed for failing twice to submit a sufficient corrective action plan. The decision-making process in the new regulations is streamlined by prescribing the use of reverse qualified majority voting to take all the relevant decisions leading up to sanctions. This semi-automatic decision-making procedure makes it very difficult for Member States to form a blocking majority. In view of the above, T2 can be interpreted as a CA surplus recycling device in favour of deficit countries, something that recalls Keynes’s proposal of an ICU. Not only can T2 accomplish the recycling of current deficits, but it can also fix capital flight (repatriation of early loans that financed previous CA deficits) from indebted countries, transforming, as we have seen, private loans into ‘official’ T2 loans. In principle, T2 may substitute the private financing and roll-over of deficit countries almost ad libitum, but there are of course limits to what Minsky defined as ‘Ponzi finance’. The austerity measures imposed by the EU on indebted countries may thus be seen as a way – unfortunately neither effective nor socially sustainable – to generate CA surpluses so as to guarantee servicing and possibly reduction of their net foreign debt. On the other hand, Keynes’s proposal emphasized the need for expansionary adjustment by surplus countries. The last sentence shows where the political problem is. The German government does not accept that it should have to adjust in the event of macroeconomic imbalances. It stubbornly insists on austerity and falling wages, which have been triggering a deflationary problem in parts of as well as the whole currency area. Deflation, as every economists should know, is worse than inflation: when prices are falling, then a) it does not make sense to run a business (outside the service sector, maybe) because you buy inputs when they are expensive and you sell your production only later when prices have fallen and b) it becomes very difficult to repay any debt with falling profit or income. Apart from that, the euro zone imposes a current account deficit on the rest of the world and whether this will work depends on how other countries react to that. In the case fixed exchange rates, it’s a policy decision (at least up to some point), and in the event of flexible exchange rates it depends on markets. The normal reaction to a currency area that turns from a balanced current account vis-a-vis the rest of the world towards a current account surplus would be an appreciation of that currency. 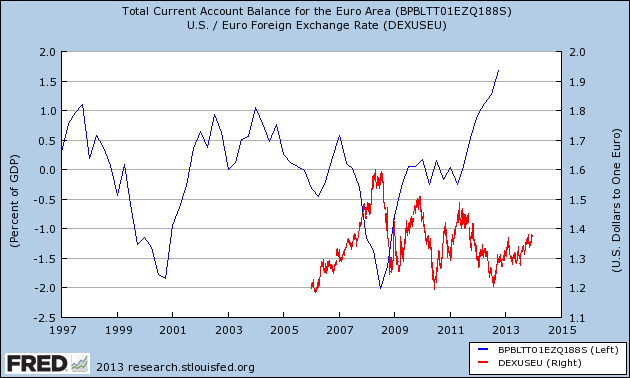 This is perhaps what is driving the euro-dollar exchange rate these days. As always, the prediction of exchange rates is something that a serious economist should always see as an exercise in ‘guesstimation’. « No alternative but to operate a restrictive fiscal policy that would have strong negative effects on output and employment! Dirk, by the way, what do you think of this post? A nice summary, Pablo. I think that you got the political economy right. German voters are not aware of how macroeconomic policies in Europe interact, and this means that public pressure on politicians will stay low. I cannot agree with the European voices that believe that the Grand Coalition will somehow correct the wrongs and stop the austerity policies. And as every economist should know, of course, running a business should be trouble free and not have anything to do with adjusting production to market conditions or knowing when to avoid debt or to tighten up on inventories.